Happy 2013 Friends! December was mighty busy and I was a bad blogger with a total of 0 posts last month! So, I'm going to start the year off right and get caught up! My class was busily learning and I had some excitement of my own this December! Much of the month was taken up by BizTown preparations (we go in two weeks!) and Science Fair preparation. But we also managed to wrap up our learning on explorers, and get some other fun activities in. NaNoWriMo was over! 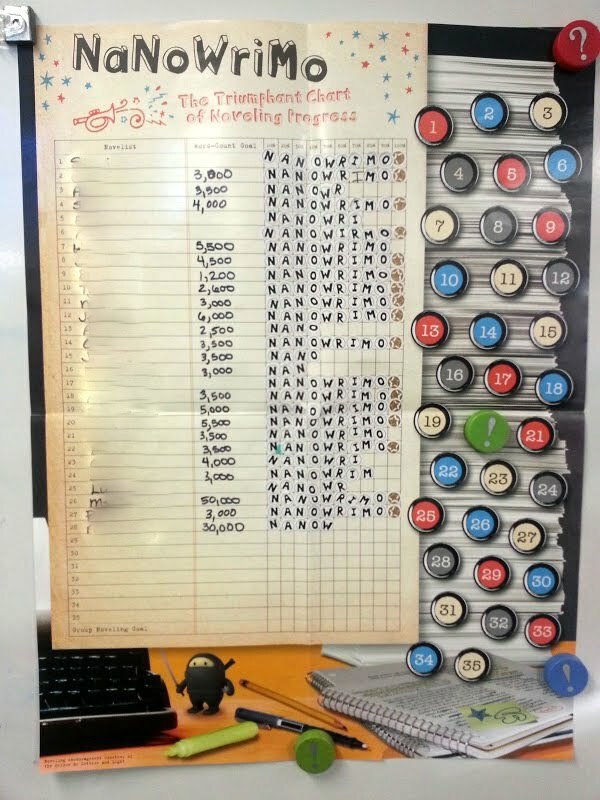 My class and I (plus all of the 5th and 6th graders, and our prinicpal at our school) spent the month of November writing novels. We celebrated by having a NaNo Cafe! Students brought in their favorite mugs and a drink mix and treats to share. We enjoyed our hot drinks and listened to an excerpt or synopsis of each students' novel. I was blown away by my amazing authors! I too met my goal of 50,000 words! My math class dubbed this day "Mega Mode Day". 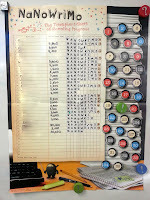 My math class has really been enjoying doing Calendar Math during our intervention rotation. On the back side they have to use numbers from the date to find the mean, median, mode, and range. Because we hadn't done Calendar Math on a day which had any repeating numbers they were anticipating December to finally have a mode. December 12 was a big deal to them, our para even brought them some treats to celebrate Mega Mode Day! I'm guessing this group of kiddos will always remember what the mode is! This was also my sister's due date! We were hoping that my new niece or nephew (she didn't have any ultrasounds/sonograms and wanted it to be a surprise) would arrive on this day and have a memorable birthday. Even though I had sub plans ready to go, there was no sign of baby. My niece was born! I was so lucky to be able to be present for the birth of my niece. 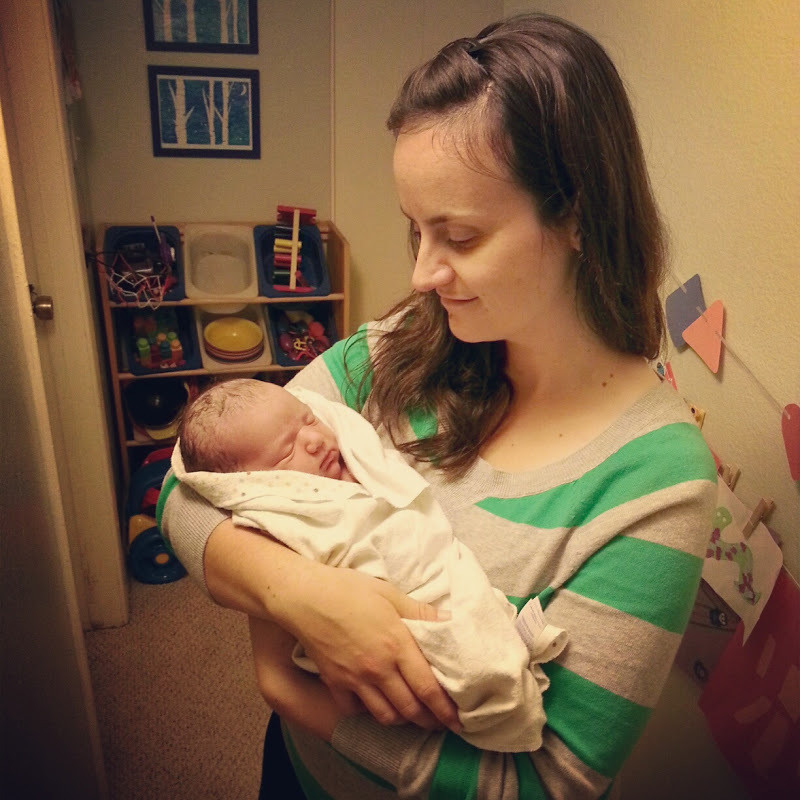 She was born at home, in a birthing tub in my sister's room. She had amazing help from the midwives and after only a few hours of labor caught her baby! It was so amazing! I just love being an auntie! 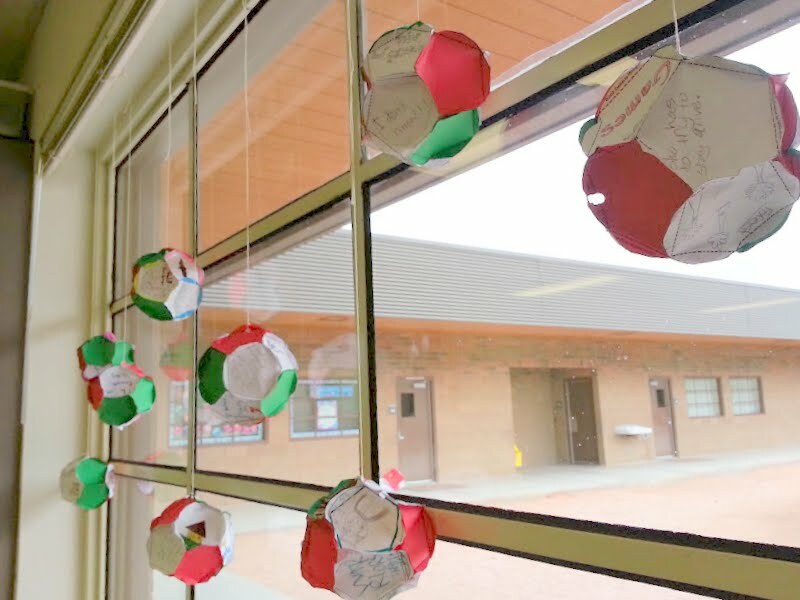 I had purchased Mr. Hughes awesome holiday dodechahedron ornament project, but because we were short on time I ended up using his template (don't be mad at me Mr. Hughes!) and combined it with our reading marathon. Unfortunately I have misplaced the origin/inspiration of the reading marathon, but I have been trying it out at the end of each quarter since I expect my students to read X number of words each quarter. This gives them a last push to get those words in. So, the students read for a set amount of time (usually around 10 minutes) and then they complete an activity for 5 minutes. This continues until we've completed all the activities and we've read tons! Some of the activities included...draw a picture of the main character, describe the problem, make a prediction...we only had time for 6, so I had the students use red/green paper to fill in the rest. 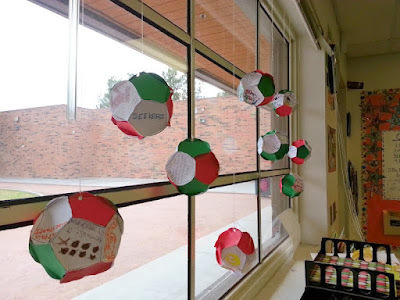 These looked great hanging in our classroom windows. 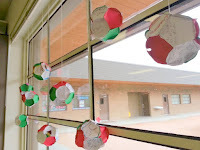 This year I was inspired by this Pinterest find for the students to make as their holiday gift to their parents. My whole team loved the idea and so we had to special order 100+ embroidery hoops from Hobby Lobby. 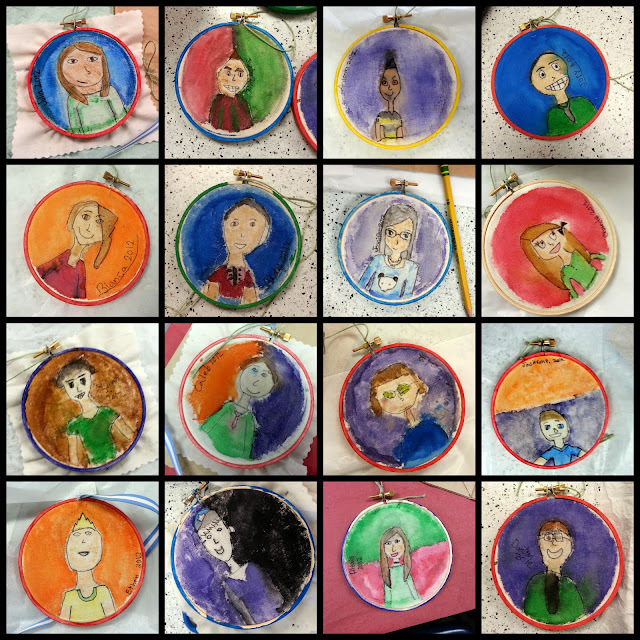 I have a wonderful parent helper who cut out 100+ squares of muslin for the project and my class used watercolors for theirs. The other teachers also had success with Crayola markers. I'm really pleased with how they turned out, I hope their parents liked them as much as I did. If I were a parent, I know I'd just cherish these! Another Pinterest inspiration was our gift to our students. 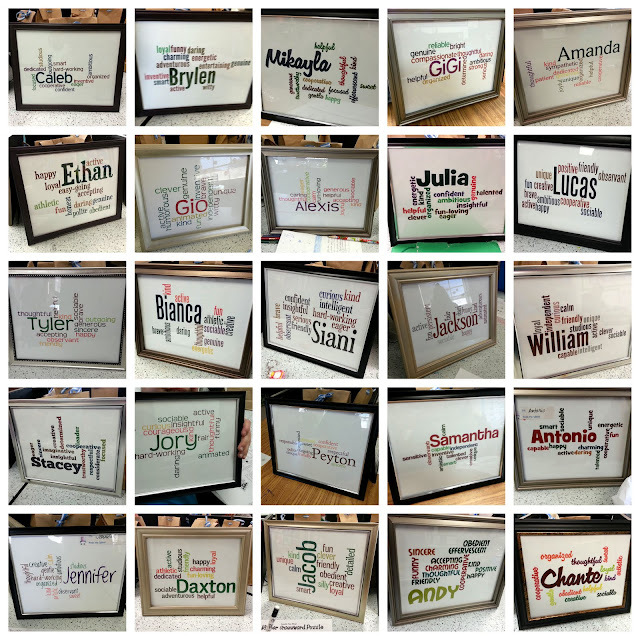 We each whipped up a Wordle for our kids and we had two amazing elves (parent helpers) who put them in frames for us, and even wrapped them! It was so generous of them to spend several hours of busy holiday time to help us out. The kids absolutely LOVED them! As soon as they opened them each kid set them at their spot to admire all day. Many even told me that they knew exactly where in their rooms they were going to put their framed name art. I heard multiple thanks during the day, and enjoyed being asked what some of the adjectives meant. Our two week break has been flying by! I've spent much of my time with my sister/nephew/niece or snuggled up on the sofa with my husband and kitties. I had hoped to get some planning in for the next quarter, as well as get some more resources created, but I've been perfectly fine with relaxing. Plus, my MacBook has been slowing down on me recently (hey, I've had it since 2006!) and so last night put in an order for a new one. I'm looking forward to some increased speed and power! I know I don't have many readers/followers, but I appreciate those that do stop by. I hope that the coming year brings renewal and prosperity for you all. I love the self-portraits !! I'm going to remember this for next year. I love the framed wordles! I need to remember that for end-of-the-year gifts. Did you use a specific site for the framed wordless gifts for the children? Super excited to get them ready! I use wordle.net, but you can also use tagxedoto create word cloud shapes!